Norway is known as the land of vikings, trolls, and druids. As if embracing their fantasy-drivenbrand, the elder ones decided to base the names of almost 300 places in their country on their word for Hell. 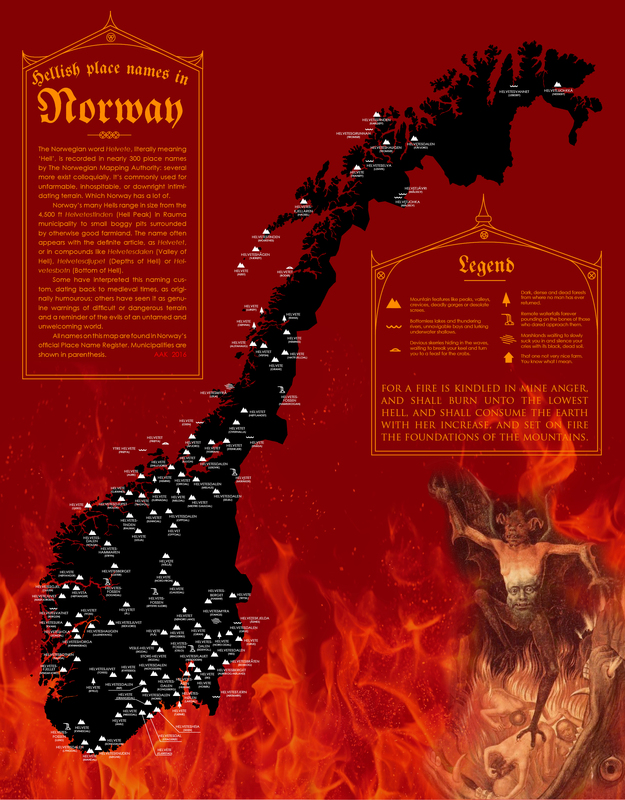 Based off of this menacing-looking poster that was found on Flickr — which features all the places in Norway which have names bearing the prefix Helvete — one could safely assume that Norway is basically Mordor. On the map, the land is dark as coal, fire surrounds the peninsula, and there’s even a creepy demon with a second face on his stomach hanging out below the map key. As it turns out, however, most of these places are absolutely gorgeous…and they’re definitely not hellish at all. Some speculate that Norway’s custom of calling everything Hell developed as a way to warn people about dangerous terrain, but others speculate that it’s just a weird Scandinavian brand of humor at play. I think it’s the latter. Why? Just check out what Norway’s so-called “Hells” actually look like. None of the many “Hell Falls” in Norway look like they lead to endless pits of despair. All of them pretty much look like places where you might find wood nymphs playing lutes to furry woodland creatures. There are at least six “Valleys of Hell” in the southeastern part of Norway. All of them are filled with beautiful tinges of lush green rather than the red walls of fire and brimstone that one might expect to encounter. Helvetesmyra isn’t brimming with lava or anything. In fact, it looks pretty much like every other swamp on the planet. If you really want to see a “Hell Swamp,” just go to Florida. “Depths of Hell” may sound like a good name for a metal band, but as you can see, it’s just a beautiful crevasse that you could probably jump across in some parts. This mountain is by no means the tallest peak in Norway (that honor goes to Galdhøpiggen, which rises 8,100 feet above sea level), but it is Norway’s tallest Hell mountain, of which there are at least three. Standing at 4,500 feet, this one is decidedly not that hellish. As you can see, Norway’s “Helvetes” are about as evil as the Helvetica font. Maybe this is just a selfish ploy created by Norwiegan people to keep all of that beauty to themselves. Next post: They should make a law.